A tabbouleh is normally made of bulgur, but I think this variety is so colourful and tasty. Especially the children are fans and in combination with other vegetables this is a goof alternative for pasta. Follow the instructions on the packaging and boil the pearl couscous in slightly salted water. Once cooked, put it in a sieve so that he can drain. Mix one tablespoon of olive oil and stir well. Avoid that the couscous is getting sticky. Rinse the tomatoes, remove the hard part and cut them into small cubes. Cut the spring onions into fine rings (both the white and the green part) Chop the red onion very finely. Remove the seeds from 1/4 pomegranate. Chop the parsley into smaller pieces. Squeeze the juice of one lime. Take a large mixing bowl and add the pearl couscous together with all the other ingredients. Keep a little bit of parsley and pomegranate seeds aside to sprinkle them on top before serving. Seazon with pepper and salt. Serve cold. 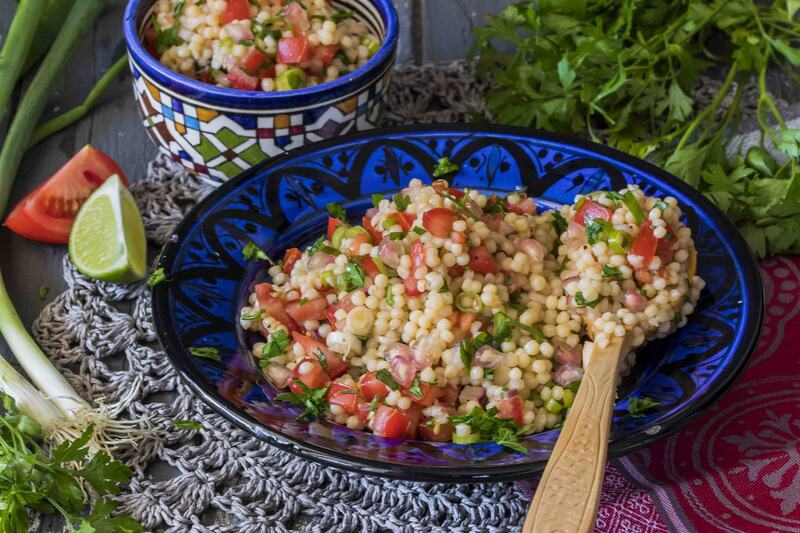 Tabbouleh is mainly known from the Israelian cuisine and is mainly made with bulgur. 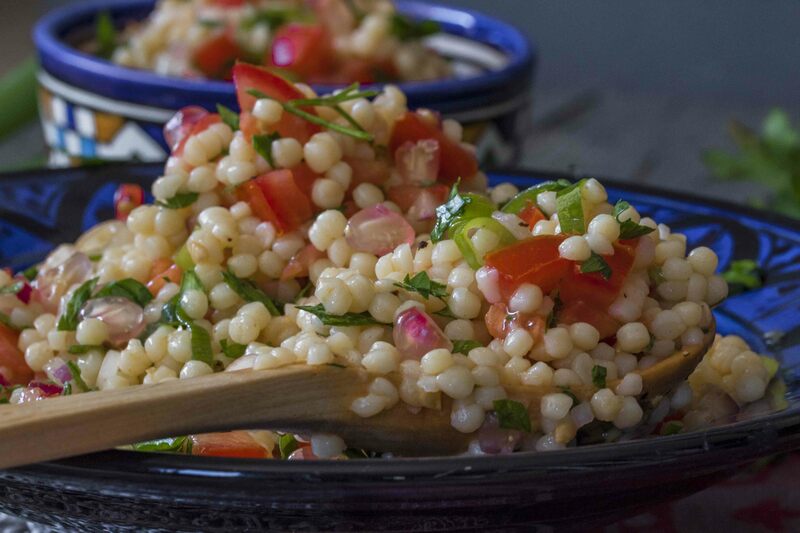 To give the tabbouleh a softer texture I like to use a pearl couscous. The most famous couscous is made from the durum wheat. In North African countries, for example in Moroccan cuisine, it is on the daily menu. Pearl couscous is larger and looks more like little round pasta balls. This couscous is typical for the Israelian, Lebanese and Palestinian cuisine. It is necessary to cook this couscous, unlike the Moroccan variety. 100 g couscous contains +/- 70 g carbohydrates, similar to white pasta. So serve as a side dish with, for example, oven-roasted vegetables or other vegetable dishes.